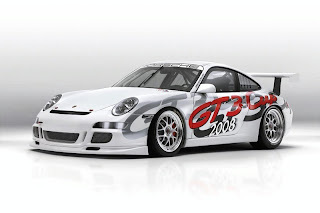 With the 2008 motorsport season almost upon us, Porsche have upped power on their new 911 GT3 Cup and will produce a category record 265 examples of the now 420 hp production-based racing car. 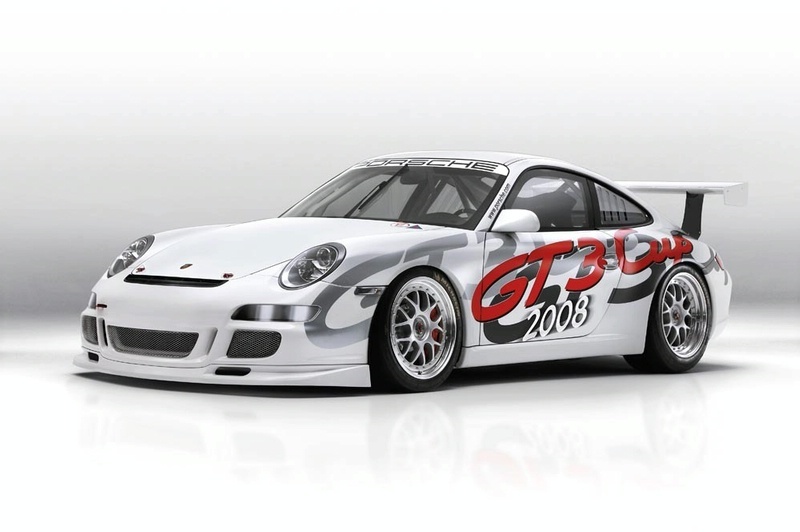 Produced in Stuttgart, the 26 examples heading for racing use in the Porsche Mobil1 Supercup, Porsche Carrera Cups and GT3 Cup Challenges will be delivered early March next year. Gaining 20 hp over the output of the previous model, the 3.6-litre six-cylinder boxer unit now produces 420 hp. And with a kerb weight of just 1,150 kg in race trim and therefore a power-to-weight ratio of 2.7 kilos per horsepower, is some 245 kg lighter (at 3.4 kg / hp) than a standard new 415 hp GT3. A six-speed sequential transmission allowing for seamless full throttle shifting has been optimised for the new more powerful engine characteristics. Keeping up with the production version, the GT3 Cup's rear end has been significantly updated, among the changes being the insertion of air venting slits to provide better heat dispersal. A modified exhaust system, producing a more commanding Formula 1 reminiscent sound, and exclusive PCCB Porsche Ceramic Composite Brakes, which reduces weight by 20 kg and increases braking response and lifetime reliability. Water-cooled six-cylinder boxer; 3,598 cc; stroke 76.4 mm (3.01"); bore 99.98 mm (3.94"); max output 420 bhp (309 kW); max torque 420 Nm (310 lb-ft); max engine speed 8,400 rpm; four-valve technology; dry sump lubrication; two-stage resonance intake distributor; central air intake; electronic MS 3.1 engine management; fuel injection (multi-point, sequential); fuel grade 98 RON premium plus unleaded; racing exhaust with fully controlled catalytic converter (400 cells); rear silencer with centrally mounted double tailpipe; special exhaust tailpipes for the Porsche Mobil1 Supercup. Six-speed gearbox with sequential jaw-type shift; compressed oil lubrication; oil/water heat exchanger; single-mass flywheel; hydraulic disengagement lever; 5.5-inch three-plate sintered metal clutch; limited-slip differential 40/60 %; rear-wheel drive. Monocoque body made of hot-galvanised steel; aerodynamically optimised front end with front spoiler; doors with side frames made of CFP and reinforced plastic door panels; rear lid with adjustable rear wing made of CFP; rear body panels made of CFP; air jack; welded-in rollcage; bucket-type racing seat (on driver's side only) with flame-resistant seat cover; six-point seat belt adapted for use of the HANS Head and Neck Support; electric fire-extinguishing system; 90-litre fuel tank; safety bar holding the battery in position. Front: McPherson spring strut axle; Sachs gas pressure dampers; double coil springs (main and ancillary spring); front axle arms adjustable for camber; adjustable sword-type anti-roll bar; reinforced front axle crossbar with six-point fastening and double clamping; power steering with electrohydraulic pressure supply. Rear: Multi-arm axle with rigidly mounted axle subframe; Sachs gas pressure dampers; double coil springs (main and ancillary spring); rear axle track arm adjustable for camber; rear axle tiebar reinforced and infinitely adjustable; adjustable sword-type anti-roll bar. Complete suspension infinitely adjustable (height, camber, track). Front: Single-piece six-piston aluminium fixed callipers; Porsche Ceramic Composite Brakes (PCCB), inner-vented, 380 mm (14.96") in diameter; racing brake pads. Rear: Single-piece four-piston aluminium fixed callipers; Porsche Ceramic Composite Brakes (PCCB), inner-vented, 350 mm (13.78") in diameter; racing brake pads. Motec display with integrated data recording; battery: 12 volt, 50 Ah, 90 Ah alternator. Approx 1,150 kg (1,130 kg with PCCB).